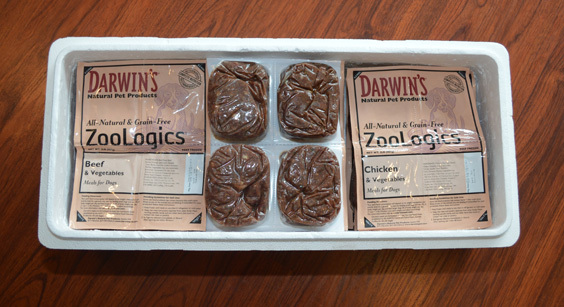 Today we will be looking at Darwin dog food, their treats, etc. Basically looking at the company overall, what experts have to say about them and what my dog Rosco actually thinks about their products. Before going any further, we are going to assume that you already know about raw dog diets. If your dog is not on a raw diet but are researching if this type of diet is for your dog or if you are looking how to switch to a raw dog diet, we suggest reading out article called “Can My Dog Eat Raw Food?“. You may want to follow us on Facebook so you know once we have it ready (we also post cute photo’s lol). 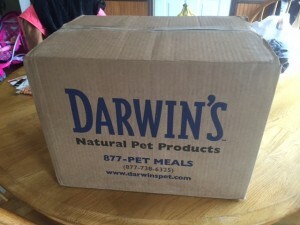 Gary Tashjian is the mastermind who founded Darwin’s Natural Pet Products. He did this after having health issues with his ten year old dog Max. After trying steroids and anti-inflammatory medicines, it was suggested that he try a raw dog food diet. He started grounding vegetables and raw meat for Max daily and noticed an immediate positive affect within 30 days. Seeing the good results, Gary then changed his other dog Casey to the raw diet as well. He watched as Casey’s skin problems that he has had since a young age slowly go away. He claims they never came back. Gary says he was sold on raw dog diets by then and shared his success to all his doggy owner friends. 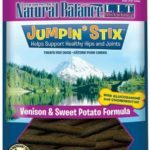 He got the same feedback from most saying that yes, it is a great natural healthy choice but who has time to prepare this diet… This is when he decided to create Darwin’s Natural Pet Products. The dog Darwin dog food company claims that they use only high quality ingredients. Our Natural Selections meals use only free-range, grass-fed beef, cage–free poultry and organic vegetables. All our meats are hormone free, steroid free and antibiotic free. We visit every farm that raises the animals we use in our meals to make sure they employ good farming practices and treat both their animals and employees with respect. They also claim no grains are used and Omega 6 and 3 fatty acids are balanced. Overall, they claim to exceed the guidelines of both AAFCO and the National Research Council for canine nutrition. 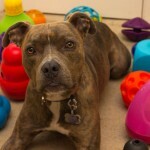 Dog food Ingredients are one of the most important things. We were already told that grains are not used in Darwin dog food which is a good thing. The ingredients used here is 25% organic veggies and 75% meat with nutrient mixed in. It doesn’t get much easier than that. Duck: this is the outer skin, meat of duck and duck bone. Duck has ten essential amino acids that dogs need and bone is obviously great for natural calcium. Heart: Loaded with protein, minerals and complex B vitamins. Liver: Like gizzards and hearts, liver is also a great meaty part of the duck that is loaded with nutrients. Carrots: Carrots are not only good for your children, they are also a good source of beta-carotene, minerals and dietary fiber for your pups. Sweet Potato: Gluten-free source of complex carbohydrates. rich in beta carotene and dietary fiber. Squash: complex carbohydrates, vitamins, minerals and dietary fiber. 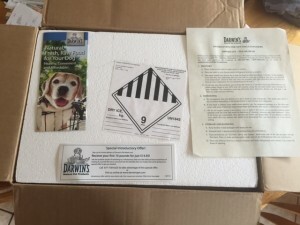 The rest of the ingredients are so far down the list, they should not affect your dog but you want to make sure your dog is not allergic to any of them. There are numerous dog related raw meat diet studies to be found. But since we are here to talk specifically about Darwin dog food, we are not going to go over them. We will talk about this company specifically. For reference, you will find a list of dog raw diet studies at the end of this section. 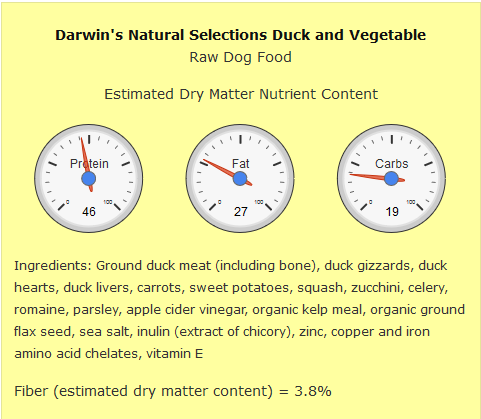 So, lets look at what Dog Food Advisor has to say about Darwin’s Natural Selections. 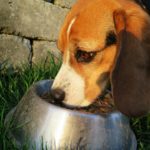 If you don’t already know, Dog Food Advisor is one of the best non-biased places to check how your dog food scores for quality. As you can see above, ground duck meat is the first ingredient listed. This means that duck is the primary ingredient in this food. Next is duck innards which are high in all sorts of good stuff (well for your dog anyway lol). So, we have tons of real meat and no filler. In most dry dog food (store bought), you will notice the “filler” like grain listed first. This is to fill your dog up and has little to no nutrition value. You can go down the above list to see everything in Darwin dog food. Just keep in mind that ingredients always start with the most used ingredient and works down to the smallest used. 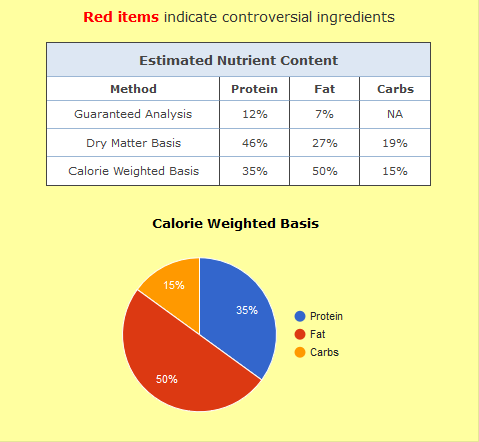 In the above Darwin dog food nutrient chart, you will see a calorie breakdown. The calorie weighted basis is as followed: Protein = 35%, Fat = 50% and carbs = 15%. After placing my order, it was delivered 2 days later. It was left on my front porch. 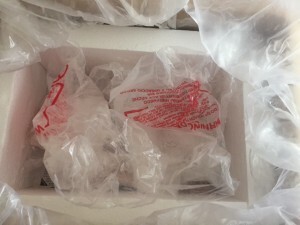 The outer box was lined with Styrofoam on the inside and a bag within that. The food was still rock solid with no unfreezing at all due to the dry-ice used. Below are photos of the the un-boxing. 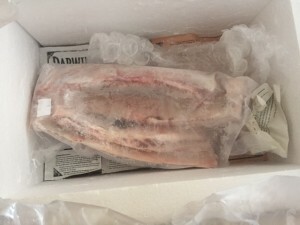 My order consisted of Green Tripes, beef rib bones, duck necks, raw chicken dog food and Raw Beef dog food. Note: Rosco is not on a raw diet but he does get raw food as treats. He is on Diamond Natural dry dog food. At times, we mix is raw or veggies as a treat. Rosco is not crazy about Diamond Natural in itself. Following the unthawing instructions that came with our package, I removed a package of food from the freezer and placed it in our refrigerator. It was thawed and ready to be served in less than 24 hours. 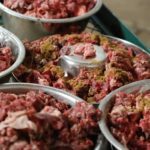 It just happen that we laid out a pound of ground beef around the same time as Rosco’s food and the Darwin’s raw dog food thawed much quicker. My guess is because of the veggies mixed in. After thawed, I put the meat on a plate to move over to his bowl, once I gave him a little sniff, it was on. He got excited and loved every last lick. There was no bad smell to this meat. The next week, I decided to give the chicken a try. As soon as he seen me place it on the plate, he got excited but once in the bowl and he checked it out, he didn’t want anything to do with it. I don’t think he even licked it. After about 20 minutes, I cleaned it up and fed him his regular food. Does this mean the raw chicken food is no good? No, it means Rosco has never ate chicken and it is just not cup of tea or something that would take a little push to get going. Since he is not on a full raw dog diet, I did not want to push it. If he is happy with the beef, then I’m happy as well. Being that it is not quite summer, we are waiting on giving Rosco the duck neck until we can spend more time outdoors. I’m excited about this one though. He has had wild rabbit that the cats have brought him (and before we found them) but he has never tried duck. I will say that the necks are larger than I thought they would be but only time will tell. As above with the duck necks, we will be waiting a little longer to give rosco the beef ribs. Be sure to bookmark us so you can see what he thinks about them. I’m pretty positive Roscoe will enjoy the beef rib bones. He has had many beef bones in the past and even other brand beef ribs. I mean, I would think beef ribs and beef ribs, right? It really depends on what your looking for. If your wanting to move to a raw dog diet, it might be best to start with something like Darwin’s. This will of course cost a little more than what you can make it yourself for but then again, most people don’t have time to put into all the work it takes. If your looking for a premade raw diet for your dog, I would have to say that The Darwin dog food company has done a wonderful job with ingredients and mixture percent. Check back this summer for updates on how the other two tests go!